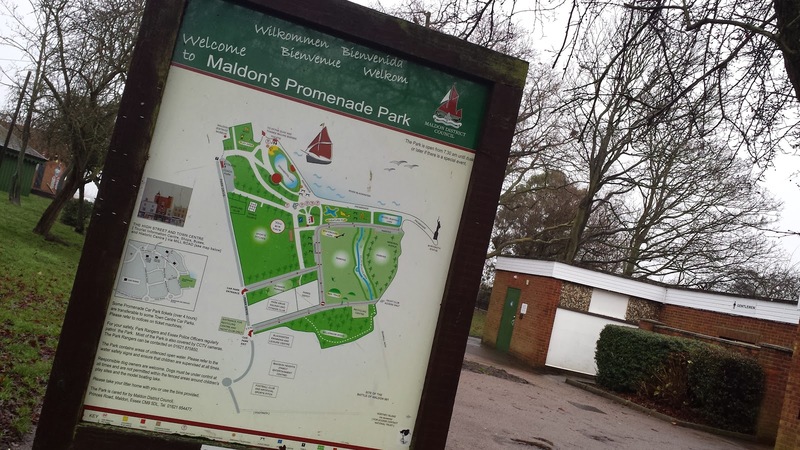 Another trip through Dartford tunnel into Essex this week, this time to run a Maldon Prom parkrun which takes place in Promenade Park, Maldon. The ladies joined me again, and this gave the the opportunity to run with my daughter in her running buggy. 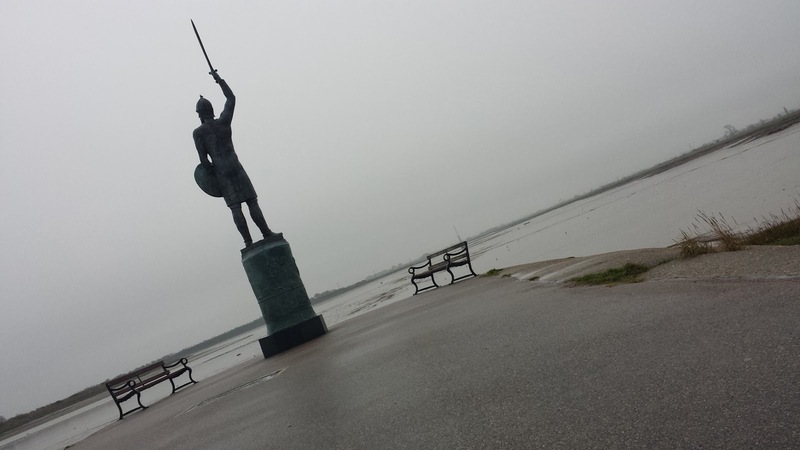 Maldon is on the Blackwater estuary and at the end of the promenade there is a statue of Byrhtnoth - leader of the Anglo-Saxon forces in the Battle of Maldon against the Vikings in 991. It is known throughout the country as the foremost modern day centre for Thames sailing barges, which you'll see as you run along the promenade during the parkrun. 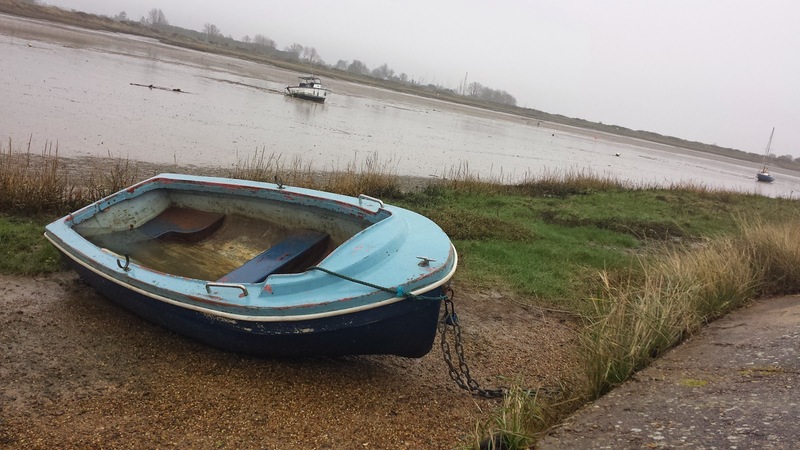 It is also famous for the Maldon mud race, where, providing the tide is low enough, competitors race through the mud to the other side of the estuary and back again. We travelled by car and parked in the fair sized car park in the centre of the park. It's a pay and display car park (£1 for an hour, £2 for two hours, £4 for four hours, or £5 for the whole day). From what I can see there is no train station in Maldon so that's not an option for any travelling tourists. If you're local, of course cycling would be an option. I didn't spot any bicycle racks but there is a fence right next to the finish line that could be used to secure it to. The toilets are right in the centre of the park, next to the very well presented children's playground - the park has a big sail ship to play on which fits in with the nautical theme of the area very well. There are also a number of food huts and a cafe as well as a marine lake, a skate park, sports fields and a bmx track. We were here on quite a misty/overcast morning, but should you run here in the summer it must be a brilliant little park to spend some time with the family. The runners and volunteers meet adjacent to the marine lake, which is in the north-west part of the park. I joined the run director for a briefing with the day's first-timers (25 running their first ever parkrun) where the course was described in detail - I was glad that I was here because the course is slightly different to the one on the official course map at the moment (25 Jan 2014). Apart from a couple of humps and one short steep slope that you negotiate three times, the course is flat. It starts on the tarmac path next to the marine lake, does one small lap of the lake and then heads off for two full laps around the park. The lap starts by swinging around a few corners and then passes the information centre, the toilets and the playground. 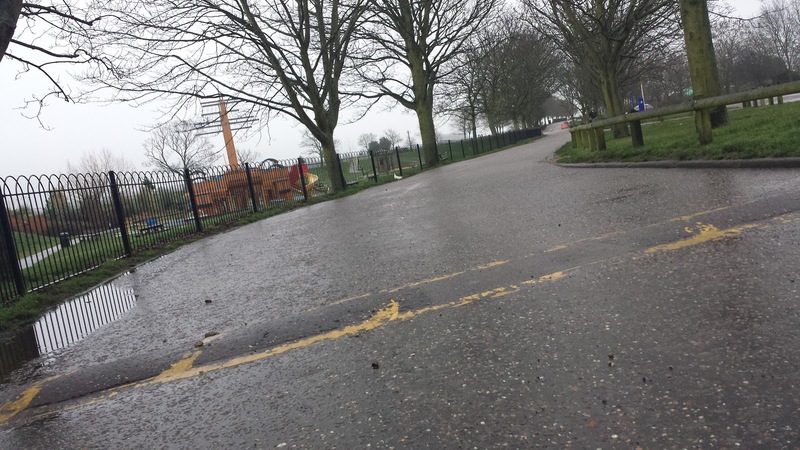 The path here is usually used for access to the overspill car parking area, but vehicles are prohibited during the parkrun. This section has a couple speed bumps (sleeping policemen) and my daughter loved being bumped over them in her running buggy, everytime we hit one she bounced right up in the air and giggled her head off! (the five point harness in the buggy kept her quite safe). After this stretch there is a right hand turn onto the grass/dirt/mud section. 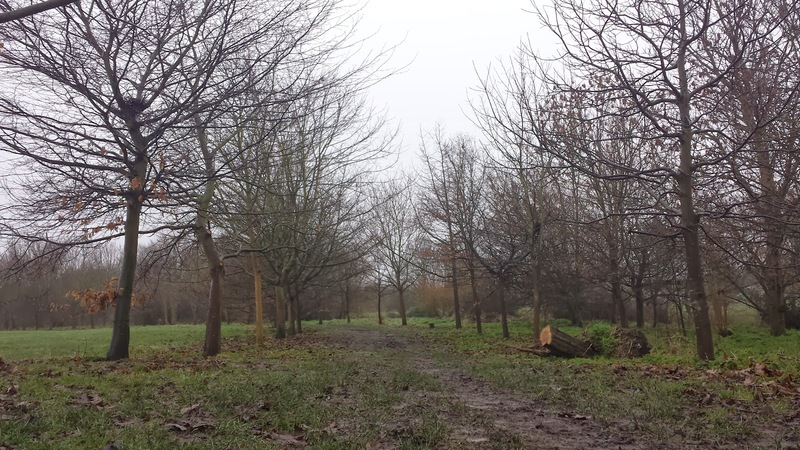 We ran here in the winter and the rain had turned the dirt path into a muddy, slightly boggy section. Many runners ran to the side to avoid the muddiest parts, but me and the buggy ploughed right through! It lasts for about 500 metres and you do it twice, so in total 20% of the run takes place on this section. I wore trail shoes to help with traction on this section but when it's dry I would go for standard road shoes. After this you make your way onto the promontory and run towards the statue of Bryhtnoth, sword in hand, thrust into the sky. When you reach him, you do a u-turn around the last bench and head along the promenade with the estuary on you right. This takes you back to the marine lake, where you circle it again. If you have only run one lap, you'll go off and do a second. However, if you have already run two laps, you will now turn right after the lake to leave the loop and make a final dash for the finish line. For the record, there are a couple of marshals in key locations around the course, and the rest is clearly marked with direction arrows - it worked very well indeed. For the first time ever, I didn't actually touch my finish token. It was given to my daughter as we crossed the line and I gave her my personal barcode as we approached the scanning area so she could take care of the whole process. The barcode scanning takes place in the seating hut thingy which is adjacent to the finish area. We ran at event 23 and it turns out that we were part of a new record attendance of 128 (inaugural event aside), beating the previous week's record by 3 runners. They say that parkrun can be 'whatever you want it to be' and today that meant a nice easy run with my daughter in her running buggy. And with no pressure to try to run a certain time, we splashed through puddles, waved to Mummy (who had the camera), chatted and laughed the whole way round. It was brilliant! For a place I'd never heard of before the parkrun started, it has a rich history and if I'd read wikipedia before visiting I would have gone to have a look at George Washington's great-grandfather's grave, which is in All Saint's parish church. I also would have known the the Marvel comics twin superheroes, Psylocke and Captain Britain were born and raised here. Go Maldon!